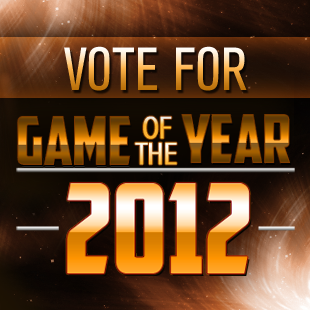 We couldn't agree amongst ourselves, so we're leaving it to you to decide the best game of 2012. There's no doubt that 2012 was a big year for videogames. From XCOM: Enemy Unknown to Dishonored to Mass Effect 3, we've played so many great games this year that we couldn't seem to agree on which game deserved to be king of the hill. While we couldn't pick just one as the best, we did manage to trim it down to a tidy 20 titles. Now we're turning to you, the experts, to determine which game deserves the top honors for the year. To get in on the action, check out our Game of the Year 2012 page, and take a gander at the list. If you want to learn more about any given title, just click "Learn More" to see all the related content on The Escapist. Once you've made the tough decision, and narrowed your own choices down to one, just click the "Click to Choose" button to the left of the title to select it, then click "Vote Now!" to submit your vote. Naturally, for a decision this big, you'll want to discuss it amongst yourselves, so please take to the forums below to debate the merits of your choice for Game of the Year 2012. Maybe you'll even sway some votes to your side. Speaking of, voting will run from 9am Eastern, December 17th until 9am Eastern, December 24th. The winner will be announced on the 26th at 12pm Eastern. You only get one vote, so choose carefully. Also, as a special "Thank You" for your vote, you'll even get an exclusive badge based on the game you chose.